As those endless summer days start to hint at coming to a close, there was still time for one last adventure around the unrivaled beauty of British Columbia. There was no better yacht to take me to those enchanting harbors stretching from Vancouver to Victoria than the Prestige 750 from Sundance. Boasting five stunning staterooms that can sleep an entourage of ten, and with a super swift cruise speed of 24 knots, she is a dream vessel for those yacht owners looking to cram plenty of Canadian action into a short expanse of time. 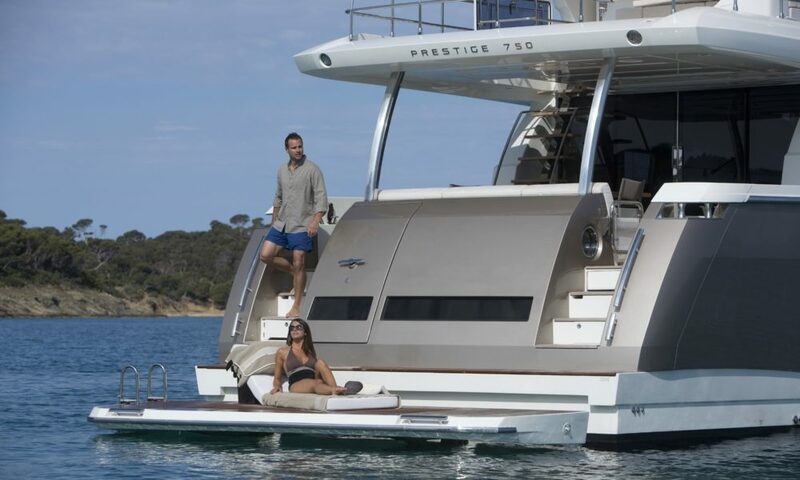 From the teak flybridge floor to the super generous swim platform – outdoor space is at a premium on the Prestige 750, ensuring that I was able to make the most of those final sweet summer days. Inside, the cruiser invites laid-back living, with striking wooden floors throughout, all the mod cons, and even a wine cellar. 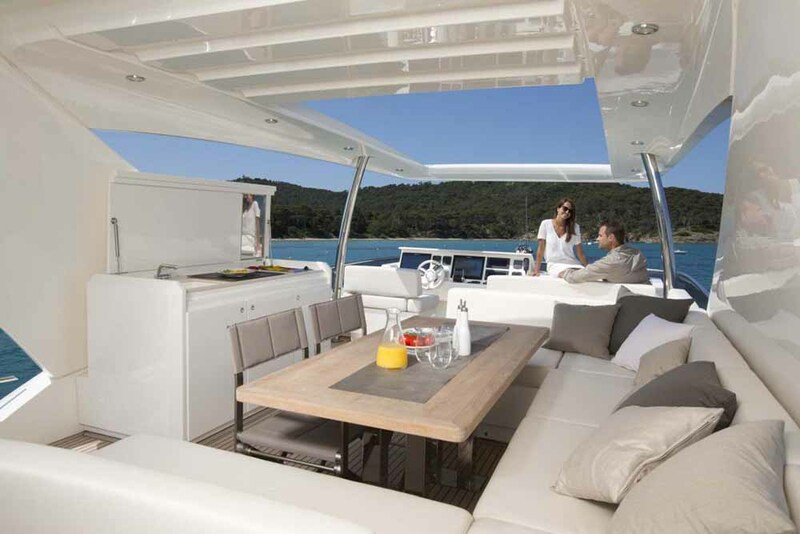 In true Prestige style I found every inch of this yacht veered towards luxury; from the Miele appliances to the retractable sun awning – a life of pure comfort has been considered. As the Prestige captures that perfect blend between being lightweight without losing strength, there is nowhere you can’t go. I started my great adventure in Vancouver at Coal Harbor. 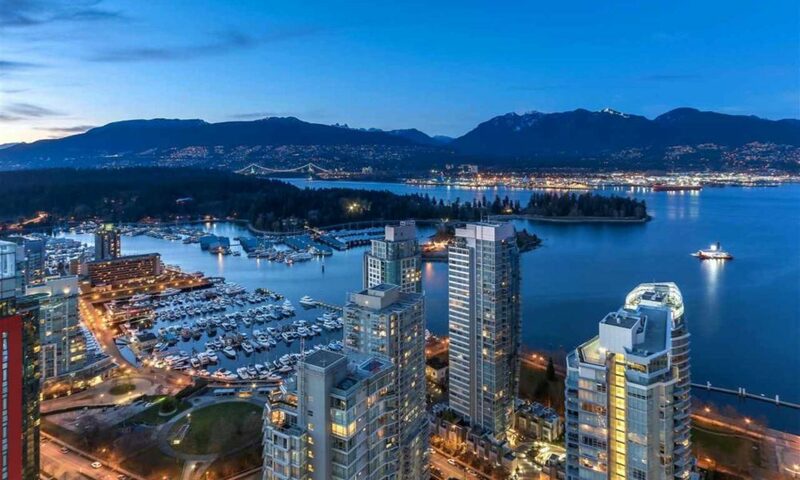 This full-service marina sits right in the heart of downtown Vancouver, meaning Prestige 750 guests can step out into the action without a fuss. 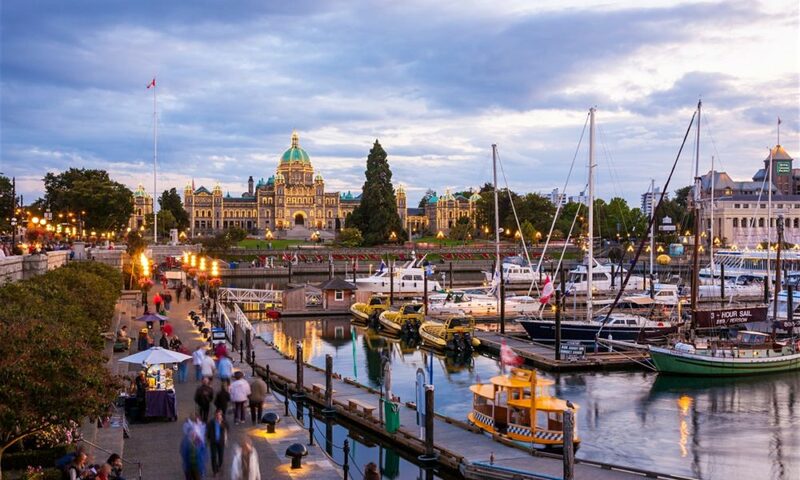 While in Canada’s hippest city, you should be sure to visit the historical Gastown neighborhood boasting one of the best culinary scenes in North America. No trip to Vancouver would be complete without a waltz or horse and carriage ride around Stanley Park, and pre-dinner drinks high in the Observation Tower gifted me a different view of the city. Afterwards, I returned to the Prestige 750 for one final nightcap on deck before retiring to my classy and comfortable master cabin. Crossing the strait from Vancouver after breakfast gave me my first taste of life out on the water. I sipped coffee on the deck and watch the mountains shift color in the morning light. Today’s motoring didn't take me far, but Nanaimo is a must for those wanting to experience classic west coast vibes. 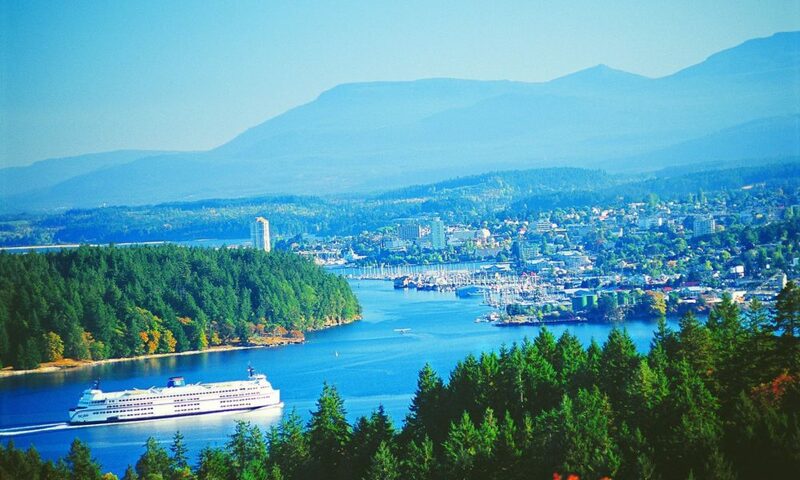 Nanaimo boasts one of the longest shorelines in the whole of Canada and is completely flanked by deep virginal forests, making it easy to step out into the wild. Those feeling brave can dive off the swim platform and take a dip in still waters, before stepping ashore to visit the Nanaimo Art Gallery and to hit the lovely little boutiques. I decided to take dinner at the Hilltop Bistro to sample fanciful local flavors against a casual classy backdrop. Finally, I celebrated my first sailing day with a flurry of activity on the beloved Nanaimo Bar Trail. The next morning I glided seamlessly on the Prestige 750 through Dodd Narrows. This is when having a yacht measuring in at 74’1” comes in handy, as true to its name – Dodd Narrows is tight. I dropped anchor at the mesmerizing Montague Harbor on Galliano Island. 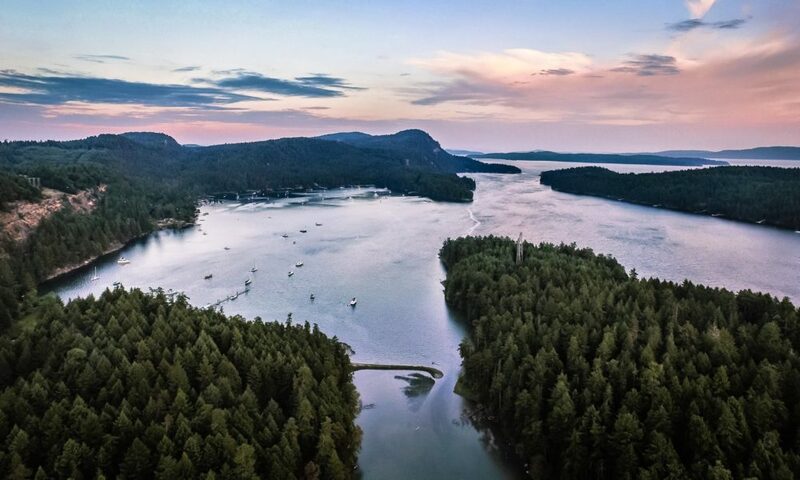 As part of the Marine Provincial Park, Montague Harbor is an idyllic spot to stop and spend the day hiking the lush natural trails, picking blackberries, sunning yourself on the pristine beach or taking the free bus ride to the charming Hummingbird Pub. The very best thing about Montague? The morning after, picking up breakfast from the local tugboat bakery. Leaving Montague behind, the Prestige 750 blasts on to Sidney Spit. I sat back on deck with an iced cold beer in hand watching the landscape of fragrant fir trees and blue waters pass on by. Those who are seeking solitude will find Sidney Spit a serene little nook for dropping anchor. Sitting at the north end of Sidney Island, this narrow sandy strip of land boasts castaway cool and exceptional crabbing. The day can be spent picnicking on the shore, swimming in the seasonally cooling waters, and walking the tidal flats where migratory birds flock come the spring and fall. This evening after a dinner of crab, I enjoyed a movie onboard as the yacht has its own iconic Bose home cinema. Next we motored to Victoria for a voracious taste of England. Sitting at the southern tip of Vancouver Island, this spot enjoys one of the mildest climates in Canada, exactly where you want to be when summer hints of leaving. Still apparent in this quiet pretty city are the strong British roots, meaning that afternoon tea, Scottish Castles, and Edwardian estates are all fine features on the tourist cards. After hitting the Royal British Columbia Museum, breathing in the flora at the Butchart Gardens, and having an early afternoon tea, I decided to take one of the tenders out for a whale watching session. The next day I decided to swing by the magically named Maple Bay and pay a visit to the local winery. The Cowichan Valley is celebrated as being a spot to embrace the great outdoors. From kayaking around Birds Eye Cove to losing yourself in fragrant lavender labyrinths, picking leaves at Canada’s only Tea Farm, and hitting up the Marina Market, life in the Cowichan Valley is fresh, organic and simple. Grape connoisseurs should certainly hit the wineries. 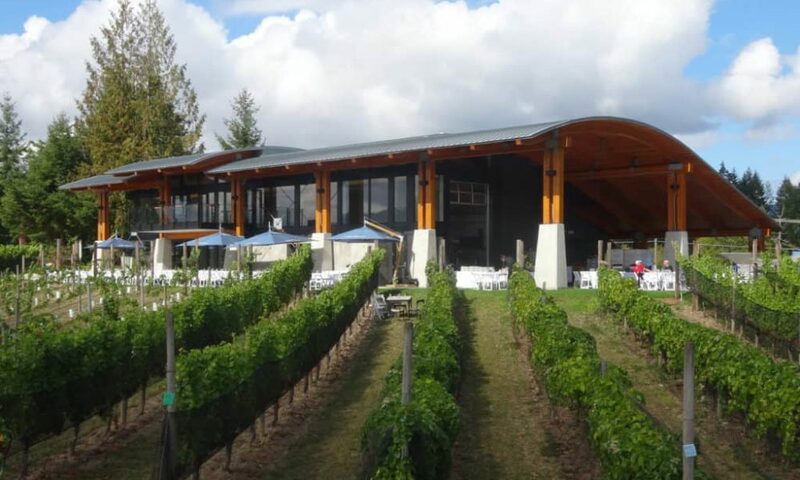 This area has a stunning terroir and whether you want to sip organic family grown wines at the Blue Grouse Estate or admire ocean views from the delightful patio of Averill Creek Vineyard, there is always an open cellar to suit your mood. I found myself returning back to the yacht with an armload of bottles to take back to Vancouver. The end of an amazing week, I journeyed back to Vancouver for a final day in the capital. A staggering week on the water was celebrated with an award-winning sushi dinner at Miku before spending the night in one of Vancouver’s most iconic hotels – the Shangri La. Those who are interested in embracing the beauty of life on-board the Prestige 750 can contact Sundance for more information.